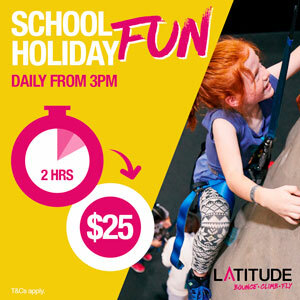 If you are looking for some family adventure close to Perth, Moore River is perfect. 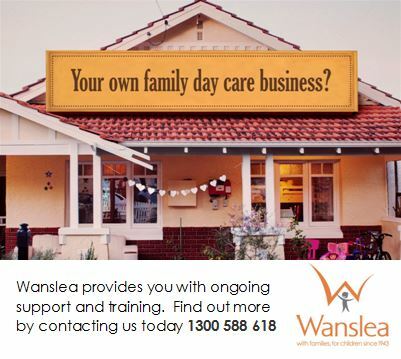 Just one hour from Perth you can make it a day trip or stay long with lots of accommodation options available. 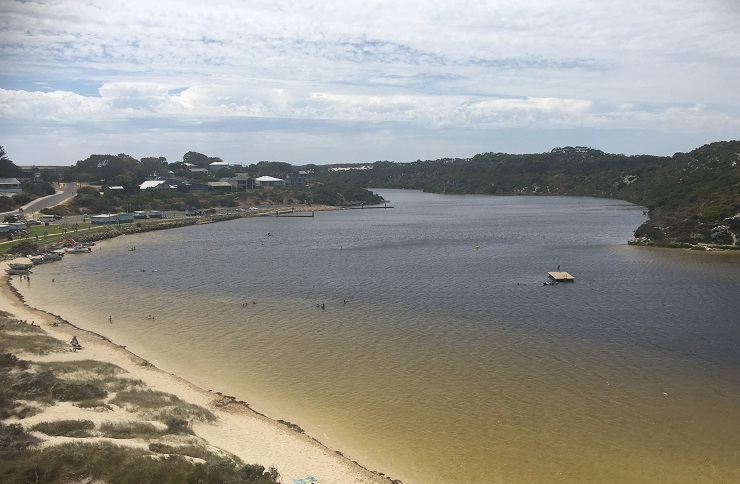 Moore River is definitely a family adventure location with the town located where the Moore River meets the ocean so is the perfect place to swim, kayak, standup paddleboard, boat and spend the day away just relaxing by the river and the beach. 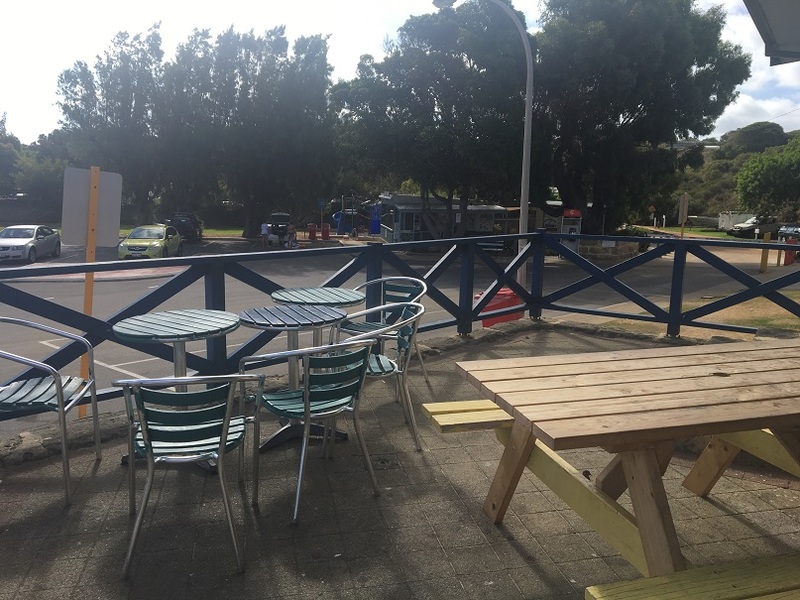 We had a quick visit to the lookout when we arrived then parked the car at the main car park near the Guilderton Caravan Park and Moore River General Store (note: it's paid parking here everyday of the week until early evening - up to $10 per day). I could barely put the car in park before the kids had their boogie boards out of the car and were in the water starting to swim out to the pontoon. 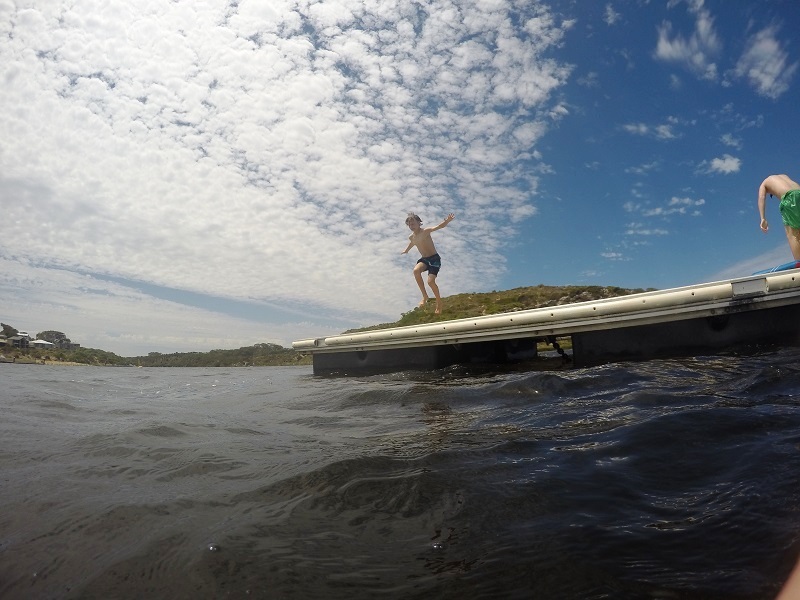 The swim is approximately 150m's and it gets quite deep, so young children should swim with an adult to the pontoon. 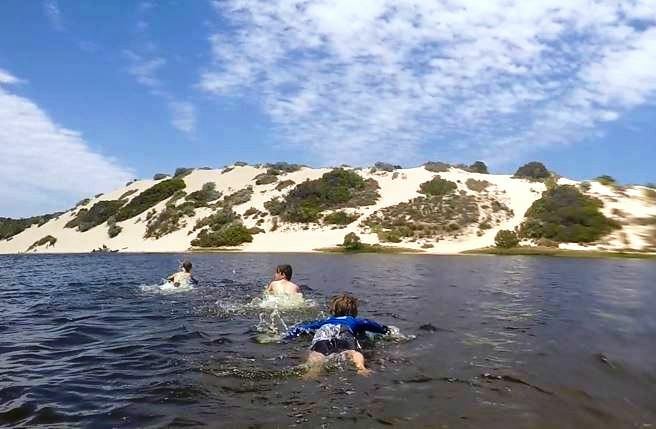 After a swim to the pontoon and back there was talk of some cool sand dunes not far from town, so we jumped back in the car in search of these amazing sand dunes. We found them across the river from the Riverside Trail. The parking area (accessible by 2WD) is found on Stephens Cres and the dunes are marked on google maps as Guilderton Sand Dunes. Note: signage indicates there is an amoeba risk, particularly in shallow water above 20C, so it's recommended that you keep your head above the water to reduce the risk and avoid jumping into the water. 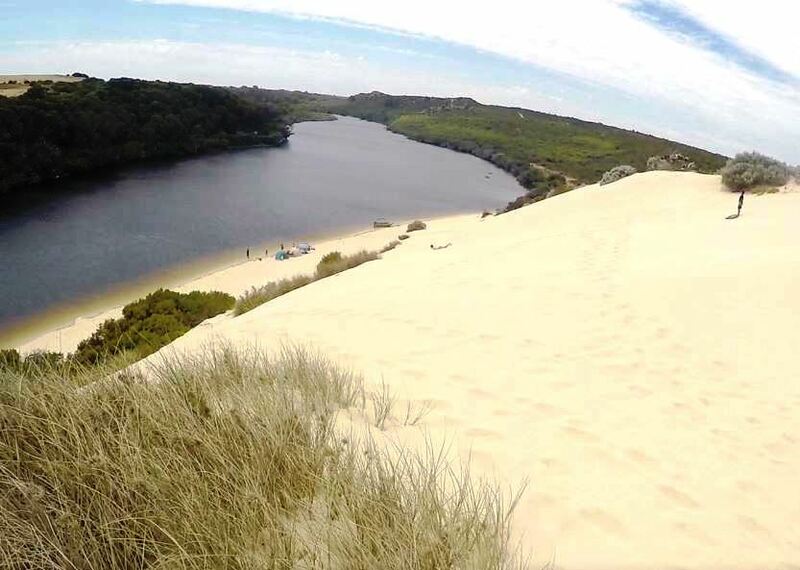 The trail starts down a short set of rocky stairs to a boardwalk that runs alongside the Moore River to a beach area when you can enter the water and swim across to the sand dunes. 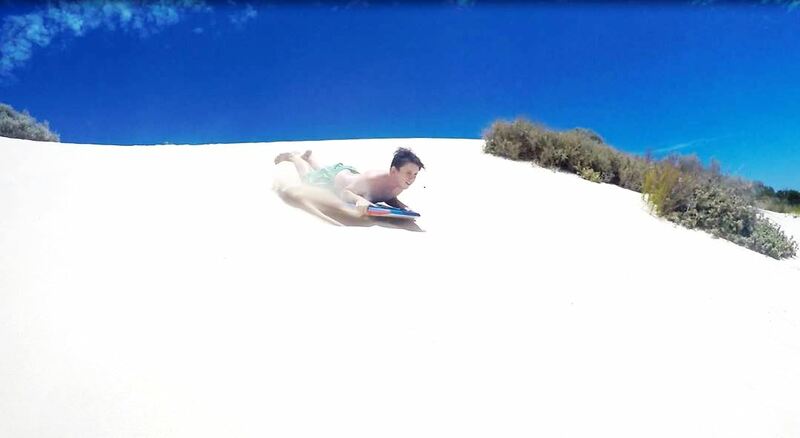 The boogie boards came in handy once again and we swam over to the sand dunes to give some sand boarding a go. It's approximately 100ms across and it was an easy swim without any undercurrents. Once again it's quite deep so young children should have an adult swim with them. If you want to take a phone or other items such as car keys across with you, we recommend you bring along a water proof bag, otherwise you will need to leave items behind. It took a few goes to work it out but before long the kids were sandboarding using their boogie boards (we found that one of the boogie boards we had worked better than the others, so take a few different types if you can). There were some people there who had made their way over by boat (this is a great spot to park up the boat, pitch a shade and spend the day too) who had sand boards and were picking up some incredible speed, so if you have a sand board definitely bring it along. The walk to the top of the dunes is a tough one, but the views from up there are amazing. We swam over to the sand dunes a couple of times as we weren't really equipped to take things over with us like water and sunscreen. We stayed for an hour or so then went into town to enjoy our packed lunch on the foreshore, then went back again for an afternoon session for another hour or so. 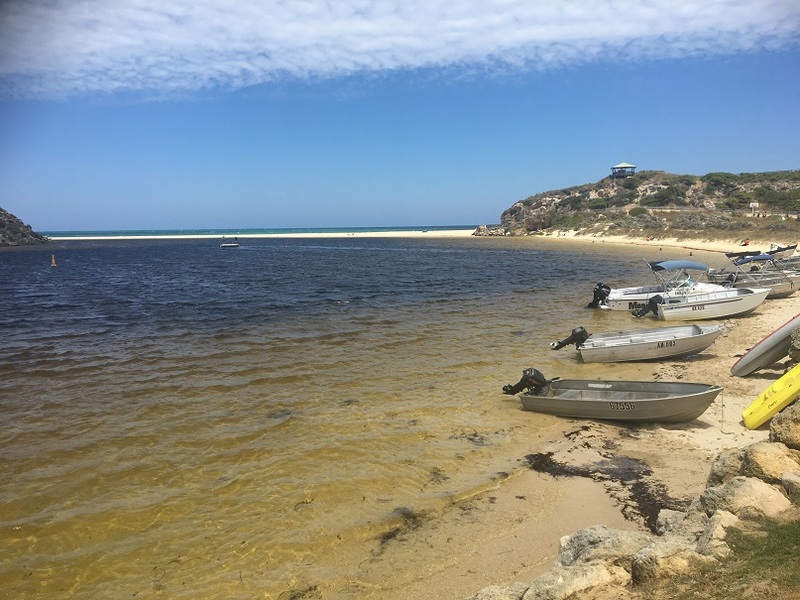 There are several picnic shelters and BBQs on the foreshore, so it's a nice spot to set up for the day (Note: we don't recommend bringing your dog to Moore River if you want to spend some time on the foreshore as dogs are not allowed here). There is a dog exercise beach to the north of the town if you want to bring your dog with you and you may find dog friendly accommodation options via the short stay accommodation websites by choosing dogs allowed as a filter. Before we drove back to Perth we dropped into the General Store for ice-creams. 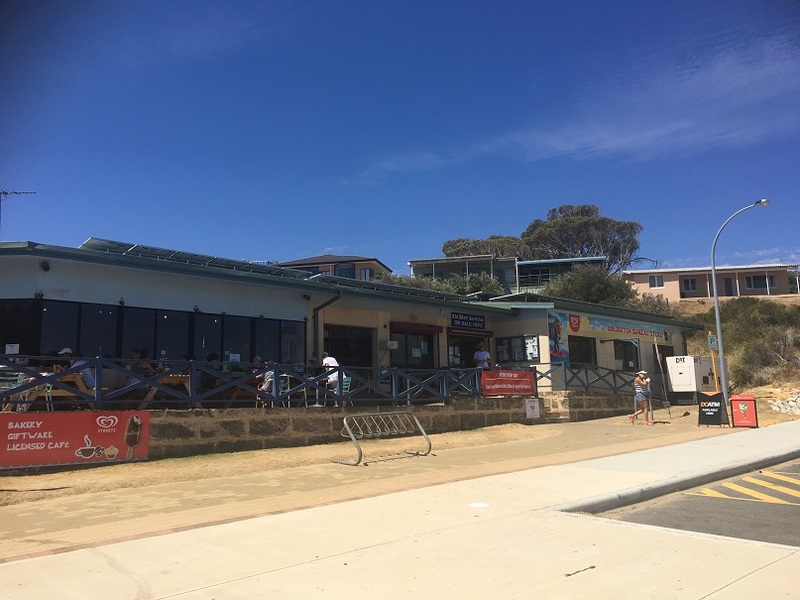 The General Store is open daily from early morning until early evening and supplies grocery items, light snacks, ice creams and drinks and also includes a licensed cafe that overlooks the foreshore and the small playground. If you want to stay in Moore River there are plenty of accommodation options. The Guilderton Caravan Park is located right on the river mouth and foreshore and includes caravan, camping and chalet options. Private accommodation is also another option so check websites like AirBnB, Stayz and Wotif for private accommodation options. 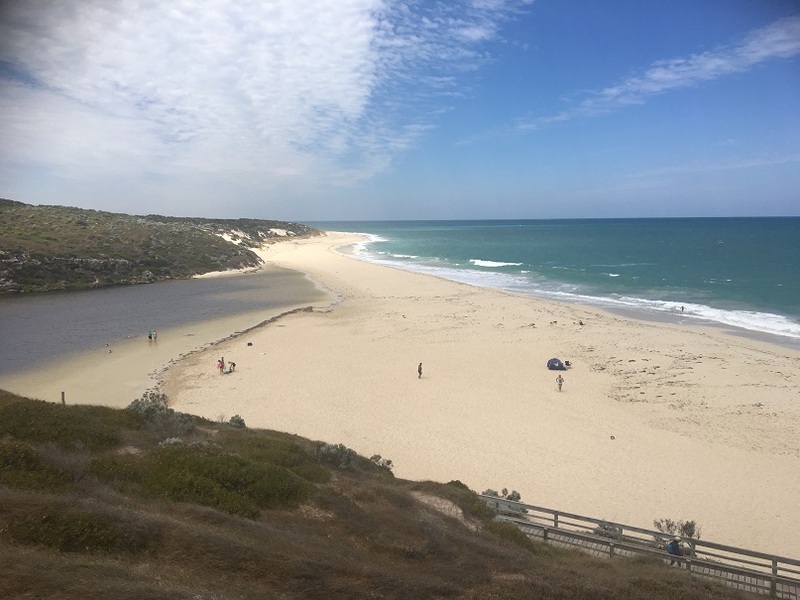 Moore River is a very popular holiday location so expect minimum stay requirements for peak times and expect to book well in advance. There are several attractions nearby if you are staying longer in Moore River and want to explore the sights of the Moore River Region. 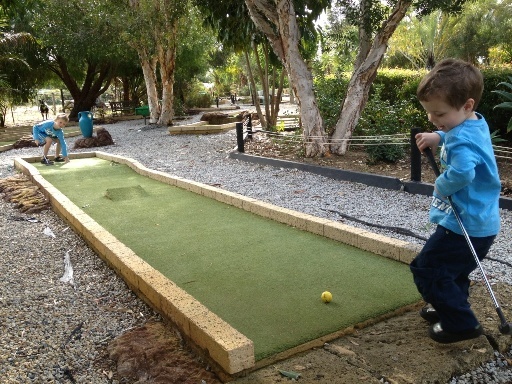 Be sure to check out Caladenia Mini Golf Park and Cafe and the Gravity Discovery Centre Gingin. You can find more local attractions on the Moore River Region website (linked below). 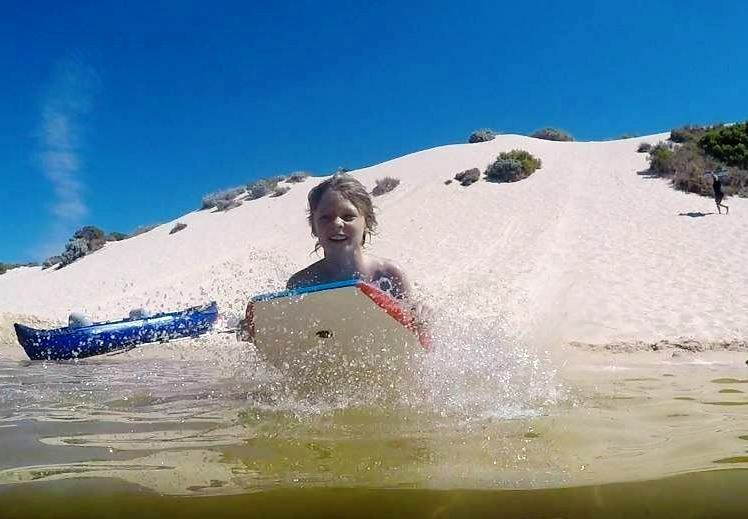 Moore River is the perfect family destination for those who love the water and love adventure. 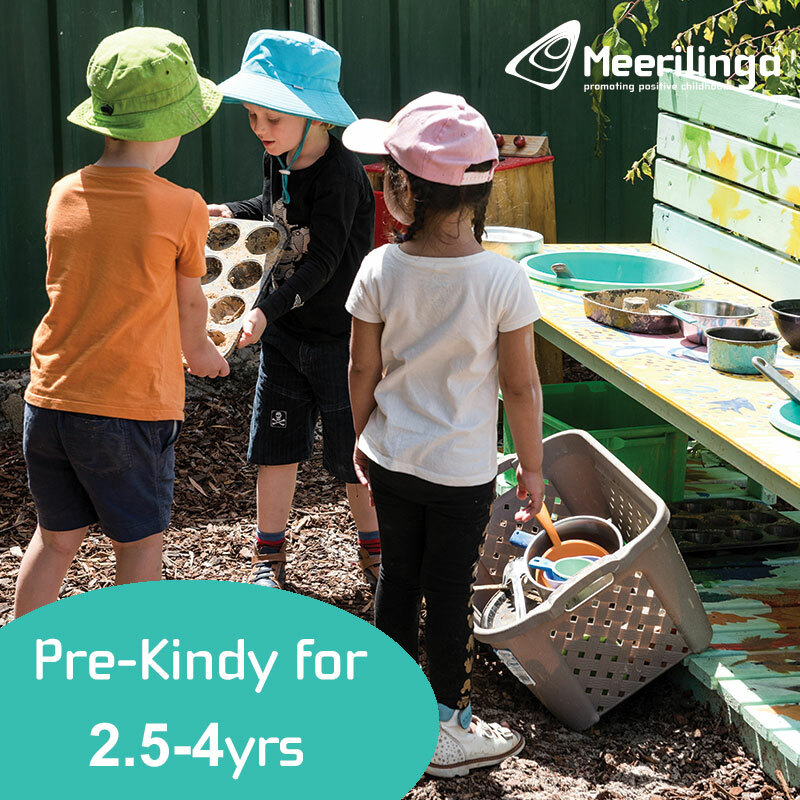 Just an hours drive from Perth, makes it accessible for a day trip, weekender or a longer stay for those looking for somewhere relax and enjoy the simple things in life. 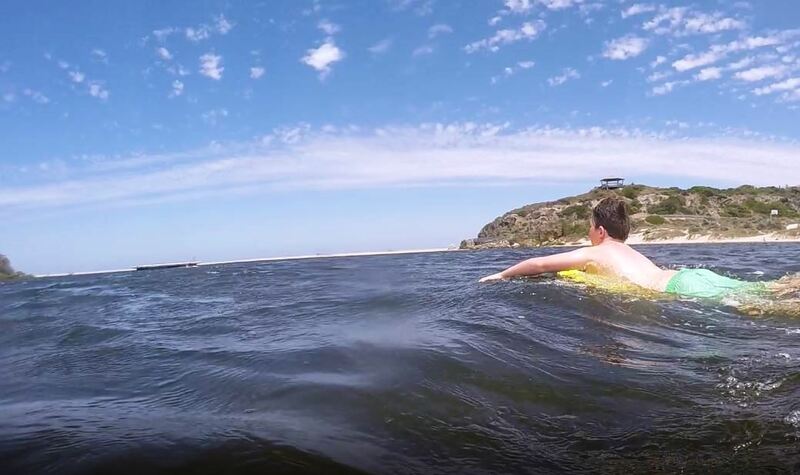 Check out the video of our day adventure to Moore River!